Alchemy has long been pursued by humanity in the hopes of transmuting common metals into precious gold. However, alchemy can be seen in the broader sense as the inexplicable transmutation of something common into something unique in its properties and the mysterious process by which it arrived there. The use of fire to turn rocks into steel is about as close as anyone has come, and perhaps even in the ancient times was revered for its intrigue. Even now, hundreds of years after the first instance of this incredible transformation, the mysteries that surround it are no less spectacular. 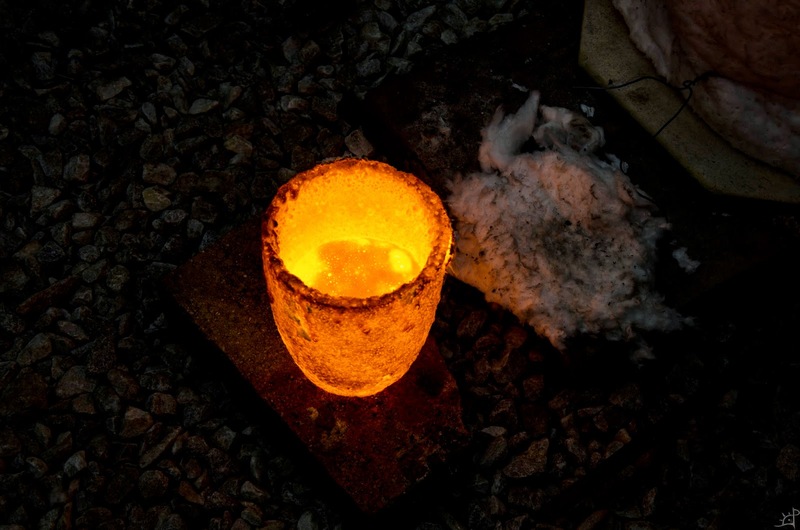 A third method of producing steel, iron, or cast iron (the first two previously discussed being bloomery smelting and hearth melting) is the reduction of material in a crucible. 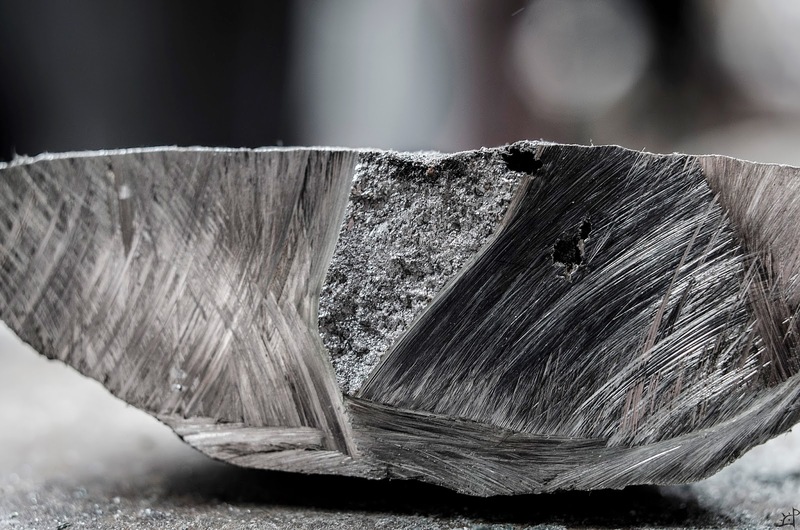 Wootz, a term which has come to mean a few different things in recent years, has become synonymous with crucible steel. Anyone interested in the subject should read this article by J.D. Verhoeven et. al. which describes much more than my own knowledge can try to explain. 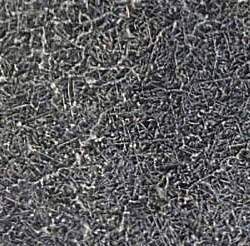 In the modern sense of the word, wootz has come to mean a high carbon (>1% C) crucible steel that displays dendritic patterns of banded carbides. This is a result of the chemo-physical process that melts the steel and what happens to it while it cools. 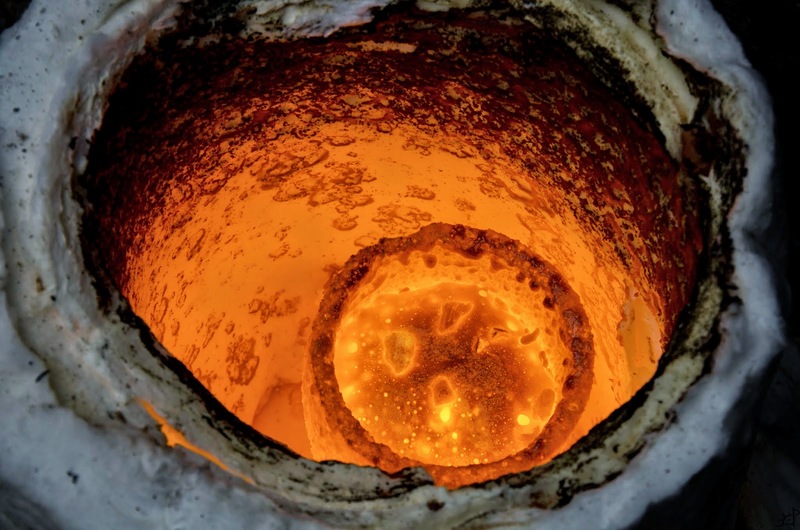 I again recently had the privilege to witness Jeff Pringle's 'atomic marshmallow' that he uses in the melting of crucible steel, and now that I have a better understanding of what is happening, I will detail the process here. Wootz holds a special beauty, and the fundamental simplicity behind the process (although it takes a far deeper understanding and years of experience to do this reliably and predictably) encourages me to try this on my own. 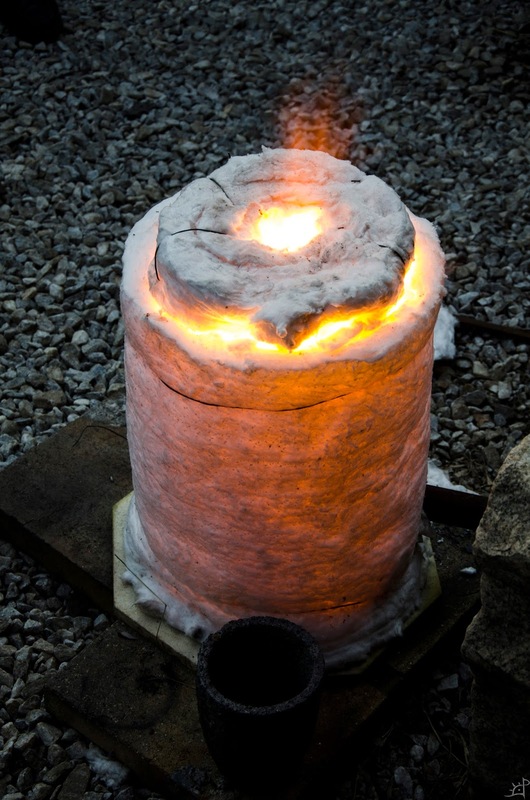 Creating a simple melting furnace is as easy or complicated as you want to make it. However, in its most reduced form, it can be as little as a blanket of kaowool bound with wire, resting atop a few firebricks. 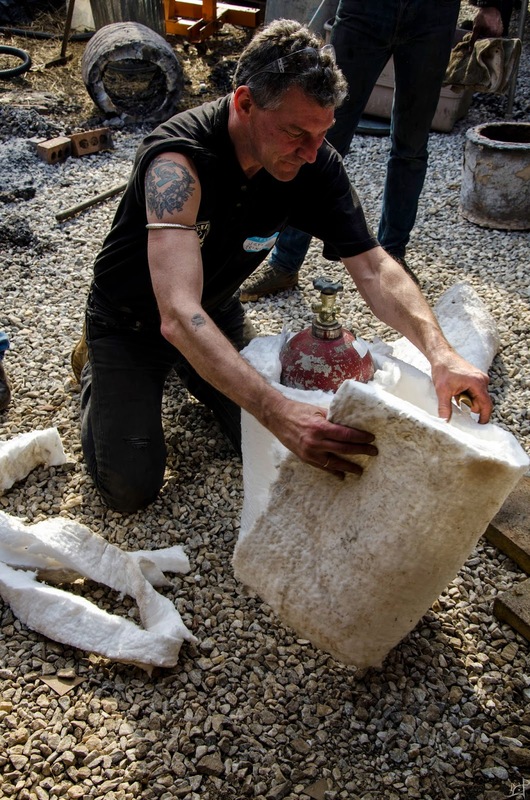 Here, Jeff uses an old acetylene tank as a form to size the volume of the chamber, wrapping the blanket around twice so it is 2 inches thick. The important part of this is to have the inside end curl in the direction of the fuel/air inlet flow so it is not forced out of place and the walls separated. A little extra kaowool on the side that bears the brunt of the blast helps it from forming a thin spot. In the above picture, it is easier to see what I mean by the direction of the blanket wrap. The inlet will be placed on the upper left side so the flow circulates counter clockwise. This will be the third melt of the day. Into the crucible goes a collection of bloomery bits, hearth steel, and a little iron sand amongst other things. Covering the surface is crushed charcoal. 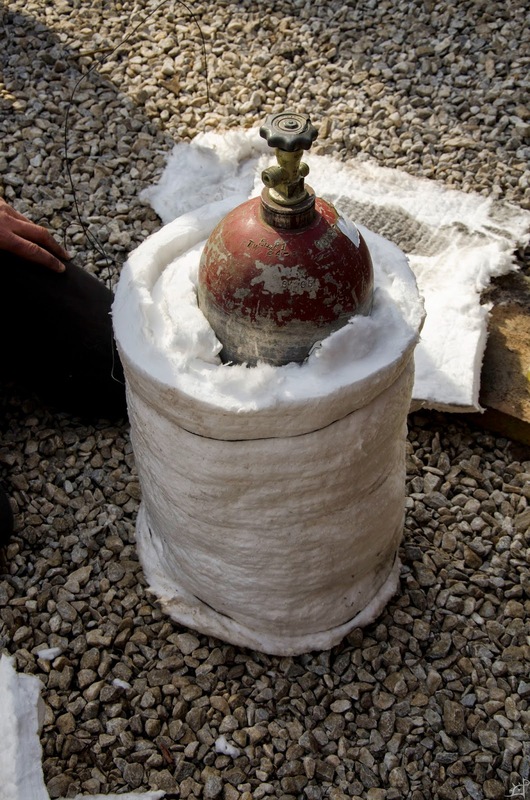 This helps absorb the excess oxygen that is not combusted with the propane as well as adding carbon to the metal. Atop the charcoal goes a few handfuls of slag glass from previous melts. Once the glass liquefies, it creates a continuous surface over the metal, sealing it off from the environment. This layer prevents oxygen from migrating through to the steel and prevents carbon from escaping. 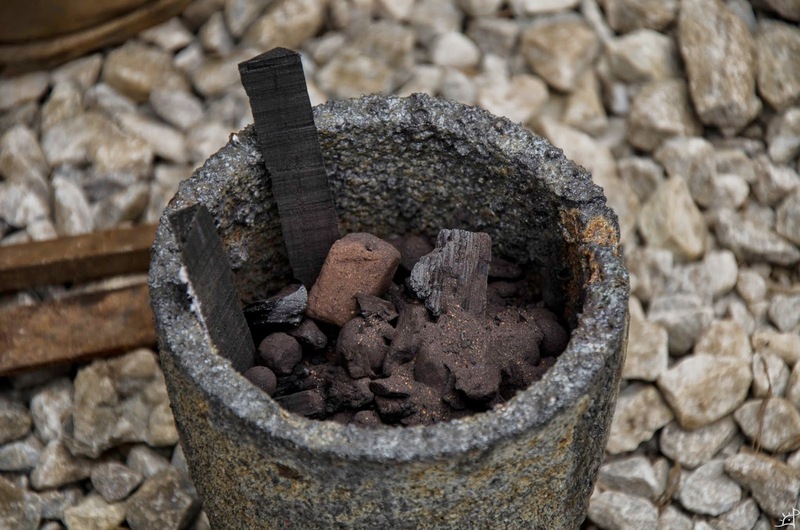 Slag also helps collect impurities in the steel and bring them out to the surface where they are easily removed. Slag is mostly composed of silicates, and as a result forms a beautiful glass (which is more or less useless other than reuse in later melts). Finally, new glass from a bottle is placed on top to increase the volume of the slag glass. Into the side of the furnace is fitted a pipe, cut through the wool blanket so it is an inch or two off the bottom. This is connected to a propane tank and a blower, making a simple burner. Adjusting this to have a good fuel/air mixture is unique to every burner and every furnace, so it takes a little tweaking until it runs smoothly. After the furnace is lit, the top is fitted in place. This is the upper 2~3 inches of the blanket cut into a strip and rolled in the fashion shown above. Wire pierced through the roll keeps it together, with a vent in the centre. All furnaces need to breathe, vice the back pressure and stagnating mixture will cause a dramatic loss in efficiency (if not cause it to fail altogether). 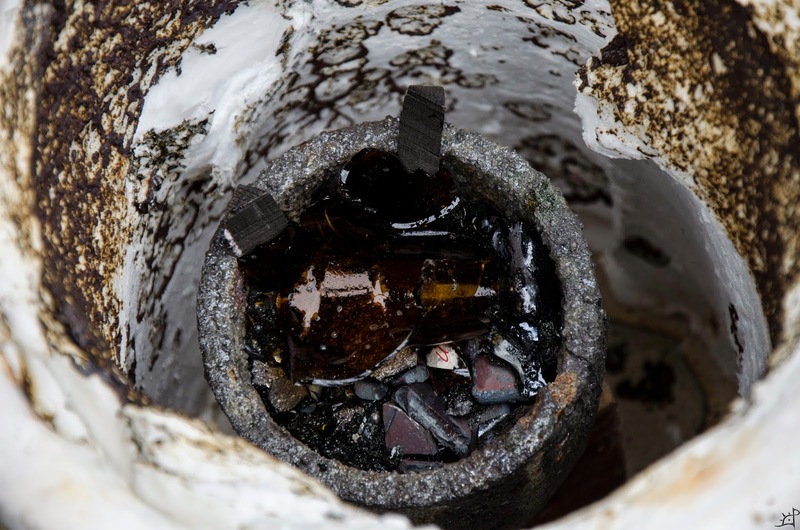 Once the steel has fully liquefied, the crucible sits for a few more minutes before disengaging the fuel supply. 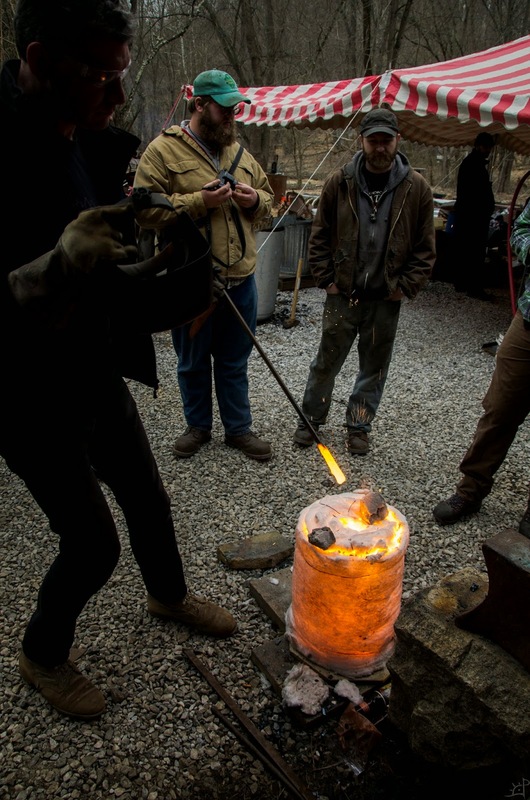 Periodically throughout the process, the contents of the crucible are stirred with a long iron rod (not galvanized or otherwise plated!!). 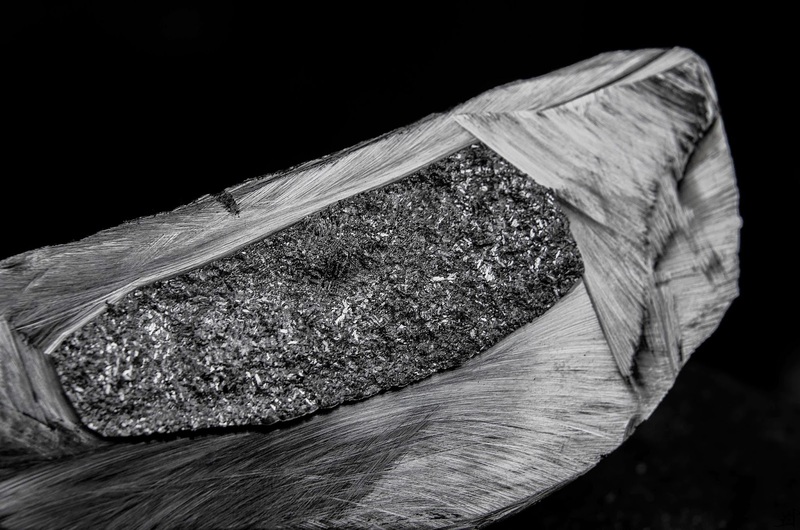 It is easy to tell when the steel has gone liquid, and to feel any solid pieces left in the crucible. Because the kaowool is rated to, depending on the grade, ~2300(F), the ultra high temperature melts degrade the layers if left unsealed. Some coat the inner chamber with castable refractory, although it is not strictly necessary if longevity of the furnace is built with acceptable losses in mind. 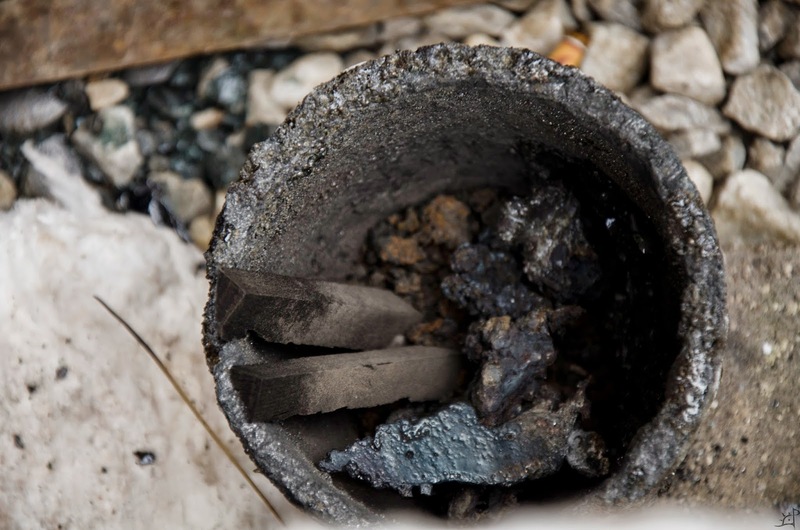 This is the crucible from the second melt (don't have any of the third) as it cools. 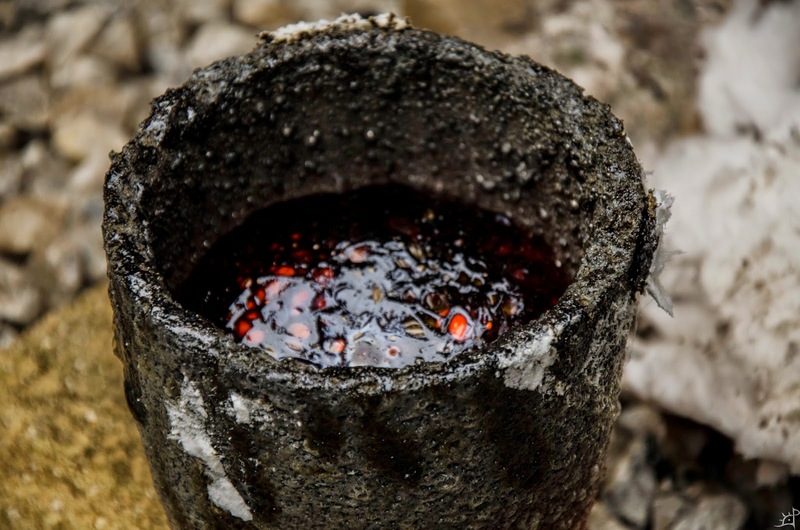 The slag in this crucible began to rise and bubble nearly to the top, quite a strange sight to watch. 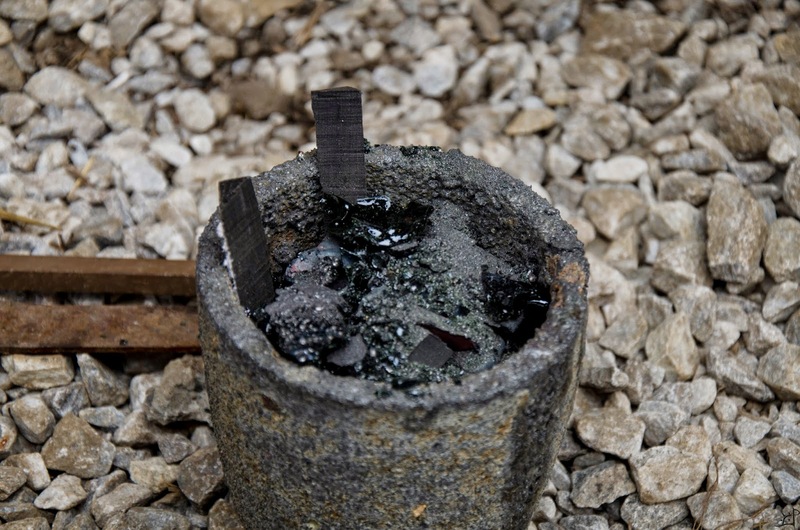 Once the crucible cools and the steel solidifies again, the slag glass can be chipped and broken away to expose the crucible steel below. As it slowly dropped from over 1600(C)/2900(F) degrees, we cut the pucks from the previous two runs. 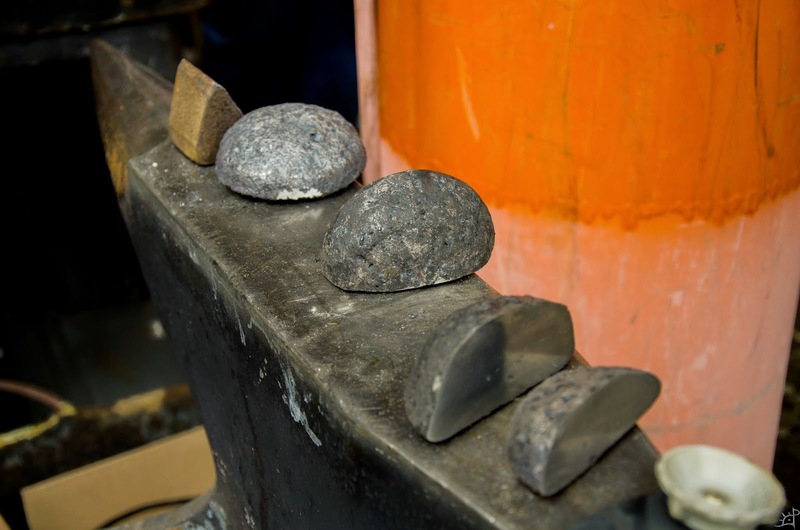 Using an angle grinder to half the steel, breaking it in the middle to expose the natural grain, the results yielded confirmation that the two were both extremely solid, relatively homogeneous pucks. Grinding these smooth, polishing the surface, and etching it reveals the dendritic patterns natural to wootz. These branching patterns are formed by the carbide clusters, which are more resistant to an etchant than the darker steel between, acting almost like a natural damascus (which uses two or more contrasting alloys of homogeneous steel [or layers of contrasting bloom/hearth steel, which is less homogeneous yet still capable of achieving contrast in the differential carbon/other alloying element] to create a pattern). Finally, after a whirlwind morning of melting, here are the results of the three melts. The one on the back is the last, the two middle halves the second, and the frontmost half from the first. Once you witness the creation of steel, there is no doubt that it is truly alchemy in its purest form.